Old School Breaks had a lovely free group break where he was giving away the hits from the box. I got the Yankees and hoped, prayed, begged and pleaded with the baseball card gods to get me something Derek Jeter. Apparently, they didn't like that and I was one of four people in the break to get nothing. However, I think I won anyway. John sent along some consolation gifts and I got some really great cards. It's always fun getting Jeter cards that I don't have as I slowly, but surely build my Jeter collection to greater heights. 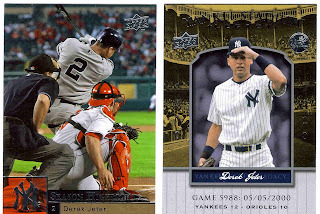 In case anyone is wondering, I have 1,213 unique Jeter cards now. I'm getting there. But that wasn't all. 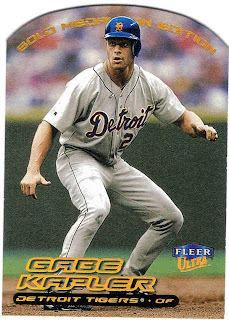 There was also some Gabe Kapler goodness sent along. And that's always fun too.